With our proven track record of quality demolition and removal, design, installation, and specialty services for floors, walls, and other surfaces, Godoy Stoneworks and Tile Care is proud to serve residential and commercial customers throughout the West Palm Beach, FL area. Whether it’s tile, VCT or linoleum, brick, pavers, concrete or other surfaces, we are well-equipped to remove existing materials, accommodating your busy schedule and any special concerns you may have. Although cultured stone is often called “stone veneer” it’s actually made of concrete that has been poured into molds and stained or dyed to mimic the look of real stone. Because it is less expensive and less problematic compared to true natural stone veneer, many of our residential and commercial clients want us to install cultured stone around fireplaces, walls, columns, and other applications. In addition to installation, we also restore and repair existing cultured stone, both interior and exterior. Improper installation, exposure to moisture or the elements, and other conditions might result in cultured stone looking less impressive than when it was first installed. We can clean, repair, and restain or reseal your cultured stone to restore its elegance. From monolithic architectural features like walls, columns, and spandrels to fine architectural details, such as caps, sills, medallions, and trim, we are your go-to contractor for precision architectural cast stone design, installation, and restoration services. We work very closely with our trusted and experienced fabricator to achieve the exact look you want for interior and exterior applications on residential or commercial properties. Architectural cast stone is a manufactured surface that simulates the appearance of natural stone. It is composed of dyed or stained cement and fine aggregates. As such, it is important to select a contractor who is very familiar and experienced with the properties of this unique type of surface. As installers, we have an added advantage when it comes to working with architectural cast stone. We have the proper tools, methods, solutions, and specialized knowledge to get the safely and effectively clean and repair it to like new. Click here to view stunning images and read about one of our architectural cast stone jobs. When you are investing in new floors, countertops, walls, or other surfaces, precision design and installation services are incredibly important. 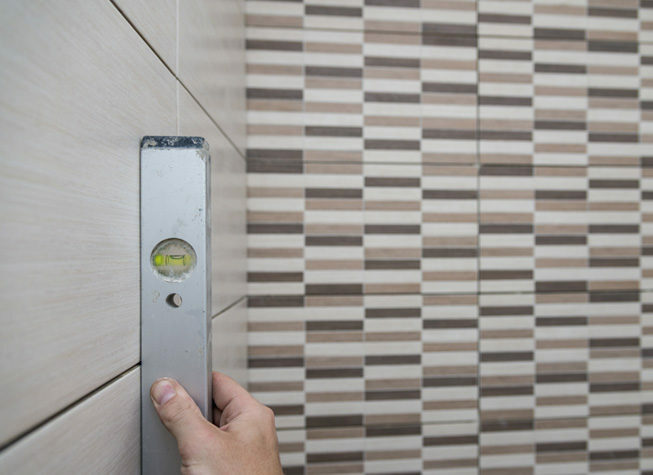 At Godoy Stoneworks and Tile Care, we install only the highest quality material for interior and exterior applications for our residential and commercial clients. Whether you are building a new home or remodeling and existing one, you can count on our superior craftsmanship. We install natural stone, quartz and other engineered stone, tile and grout, clay tiles, brick, pavers, architectural cast stone, stucco, and more. Our tile mosaics or custom inlays can provide an extra flare to your space and showcase your unique personality. Our skilled technicians have the knowledge and experience to create the perfect outdoor kitchen, fire feature, pool surround, patio, driveway, entrances, walkways, or other outdoor surfaces that you can enjoy for many years. We take many factors into consideration as we plan your installation, from the condition of the substrate to settling of the slab foundation, and for exterior applications, drainage and runoff, exposure to the elements, and other issues that can effect the longevity of your installation. For a FREE estimate on demolition and removal, stucco work, cultured stone and architectural cast stone services, or other installation, cleaning, and repair services in Broward, Palm Beach, Martin, and Indian River Counties, fill out our online contact form or call (561) 502-0692 or (561) 797-9592 today.